The Pentamerone is a collection of fifty folk tales written by Giambattista Basile in the Neopolitan dialect. It’s based on oral stories he collected while he was traveling around Venice, Crete and wherever he’d find people who would tell him a tale. It’s a phenomenal collection, containing just about every major motif of the European folktale genre, told with an abundance of metaphor and hysterical turns of phrase. Richard Burton did a great translation of the material, and that’s what I’ve been working with. I’m not going to give you much information Basile and the history of the Pentamerone. If you want that, go to wikipedia. If you want to read the stories themselves, (and why wouldn’t you?) Burton’s translation is available free and online. I love the internet! Instead, this will about my adventure – the story of my love affair with The Pentamerone and the journey I’m still on with these amazing tales. It will take the form of two blog posts in which I’ll outline my Pentamerone project, why it failed and the show that blossomed as a result. The Pentamerone has a fairly complicated frame story, in which a heroine has her handsome prince tricked away from her by a slave. (The false black slave is a clear example of the unfortunate stereotypes in The Pentamerone. I’ll talk about dealing with them later.) With some magical assistance, the girl manages to make the slave crave stories, and her royal husband enlists the help of ten grotesque women to keep her satisfied with tales. For five nights they take turns to tell stories, the prince’s servants perform short plays, and we slowly build to the Prince rejecting his cheating wife and settling down with his intended love. 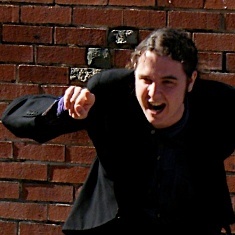 Most of the stories contain at least one moment where a character launches into an impassioned speech on one topic or another, and it has been fun to try and preserve some of the manic character of these monologues in live performance without loosing the audience in self-indulgent ranting or robbing the story of its internal integrity. I’d read one or two of the more famous stories from The Pentamerone by the end December of 2011, and I decided to make an unusual resolution for 2012. I would learn one story a week until I had them all in my repertoire. I was fascinated by memory techniques at the time, and the aim was that I would construct a “peg system” that would let me recall each story for performance along with where it fit in the cycle of 50 and which of the ten storytellers told it. One story a week seemed realistic, and if nothing else it would help me build up my repertoire. It was a crazy task and ultimately one I failed to complete, but I learned some really valuable lessons and some quality stories along the way. When I set myself a goal of learning one story a week, I found myself confronted with the question of what it means to have learned a story. Repertoire is a big topic, one that I’ll tackle at length in a future blog post, but suffice to say that I didn’t expect to have each story finely honed, rehearsed, with polished patterns of phrase. Neither did I expect to have them tempered by repeat public performance. I settled on being able to remember them well enough that I could rattle them off in conversation, and that I’d feel happy pulling them out in a ceilidh style club format. My wife often found herself on the receiving end of the learning process while I was letting these tales sink in. We were in a long distance relationship and every night we had an hour of skype time to fill with the news of our respective days, our complaints about how unfair it was that we were apart, and our respective artistic practices. She read me poems she’d written, a collections inspired by the grisly jumble that is the Pitt Rivers Museum in Oxford. I’d tell her stories from The Pentamerone. I didn’t get many other opportunities to tell these tales. Most months I would bring one to The Story Forge, the club I host in Sheffield, but picking out a good story was tricky. Many of the motifs were familiar, on several occasions I was faced with the fact that a version had been told recently in that club, (David Hague, I blame you!) or that the story was too long or would need substantial reworking to make it both a good club opener and something that I was confident telling. There were other open mic spoken word nights in Sheffield, but if I’m going to an event that’s predominantly a poetry night I feel like I really have to champion storytelling as an artform, and so new, clunky and lengthy material isn’t suitable. Which left me a bit stuck. I found that I didn’t really have the discipline to learn the stories if there wasn’t a chance to really tell them. Furthermore, there were other stories that I wanted to learn, either stories I’d find in written sources or stories I heard from other tellers. I’ll even admit that after several months I found I myself feeling less enamored with the flavour of Basille’s stories. They were good, but I needed variety. I also found that the artificial structure I’d given myself of learning all 50 stories wasn’t helping me. One week The Pentamerone would offer up a story about some twins who were so alike as to be mistaken for one another with hilarious results. A month later I might find a story about a King and Queen who, through magic, were blessed with a pair of boys who happened to look exactly alike. Now my inclination as an artist was to put those stories together. One had a great beginning, the other a good end, they would clearly work better combined, but I had set myself a target of learning all 50 as discrete and separate tales and that would undermine the stated goals of the project.. In the end, I abandoned the endeavor. In fact, there are some parts of the second half of The Pentamerone that I still haven’t read. It had been fun, but it wasn’t really helping me as a storyteller and it wasn’t as if the stories were going to run away if I left them for a few months. Some great things did come from the project though. I confirmed that learning a new story every week was certainly possible, but that I needed to create opportunities and spaces to practice. I learned a whole set of wonderful stories, some of which weren’t that common on the telling scene. I had a great experience at Beyond the Border where strangers started talking to me about my Pentamerone project because they’d been following my progress on twitter, and that made me think a bit about how to use social media. Then I got an email from Kat Quartermass about her Dreamfired Storynights, and ultimately, by the tale end of 2012, I was touring a show of stories from The Pentamerone. Quite how that show came about and the creative decisions I made putting it together will be another blog post for another week. There’s a story I’ve heard about a drama instructor. He was berating his students one day for failing to grasp the most basic points of theatre. And the student did. And when she had finished, the instructor asked the class what they had seen. They mumbled, and eventually offered up that they had seen their peer walk onto the stage, point and look upwards, and recite her line. Again the walk, the point. Again the class had to describe what they’d seen. Again they described the walk, the point. What more was there to say? One after another the instructor had them all carry out the task. For a while, the answers became wonderfully detailed, addressing every step the actors had taken, the height of the point, the tone and inflection of the words spoken. But every time, the teacher seemed disappointed at the performance, and the students were puzzled as to what they were missing. He got up onto the stage. He walked until he was a little off centre. Then he pointed upwards. “Look at that moon!” he said. But when he asked them afterwards what they saw, the students didn’t mention any of that. They had had one singular experience, one that made sense of the whole exercise. “We saw the moon.” They said. Storytelling and theatre are different animals, though related both by virtue of being narrative arts, of being spoken performance arts, because they can sometimes take place in the same spaces, and because they draw on similar theoretical models. I’ll probably be writing a blog post about the difference between digesis and mimesis at some point soon, because I think they’re really useful concepts and that we should be using them in our discussions. But I love the story of the drama instructor, and I think it has some really interesting parallels within storytelling performance. Storytelling consists of at least four things. There must be a listener, there must be a teller, there must be a story, and there must be a telling. I separate out the telling and the story, the ‘telling’ is the particular performance that takes place between listener and teller, whereas the ‘story’ is the underlying narrative of which the telling is one specific rendition. All these four elements relate to one another in ways that we will be exploring more on this blog in the future, but for now I want to get to the crux of the drama instructor’s lesson, and in so doing echo the wise words of Sally Pomme Clayton. As tellers we normally want to “become invisible.” That’s not to say that the audience can’t see us, the students watching their drama instructor could certainly see him. That’s to say that what we do during the telling should support our purpose of conveying the story to the listeners. The story doesn’t take place on the stage, that’s where the performance happens. The story doesn’t even take place in the space between teller and listener, as is so often argued. The story takes place between the listener’s ears, in their heads, and telling the story well means making artistic decisions that are mindful of the listener’s experience. That should be our first concern. Or at least, that’s the model I’ll be working on here.